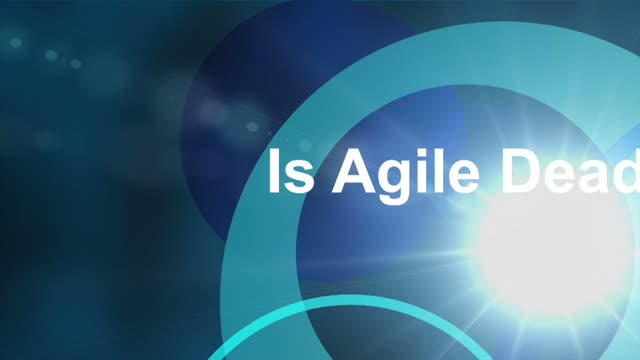 In an industry that loves the buzzword, none seems to be thrown about as often as Agile. Agile’s principles and process are broad, and the term is frequently misapplied, but the benefits of agile can’t be understated - eliminating “Waterfall” development, reducing risk for companies that adopt it, and creating a good work and team dynamic for developers worldwide. Nowadays, though, simply being “Agile” doesn’t fully enable rapid and consistent delivery of software at scale. True agility doesn’t only arise from process, it also needs to be supported by tools and methodology. The core best practices from the Agile Manifesto still hold. A modern development team will always benefit from holding these tenets. However, unless you have a good Continuous Delivery framework behind your development team, you may find that you’re working harder than you need to to meet demands in today’s environment. In this seminar, Dev9’s Will Iverson will discuss the process and tools that can help to make sure that “Agile” actually provides you and your team with a solid delivery strategy, instead of just a nice label. We’ll discuss how you can automate and accelerate the parts of the process that drag teams down and increase cost. If Agile is dead, what it needs is a resurrection, not just an autopsy! Watch Dev9’s Google event video for an enlightening discussion with Kubernetes Product Manager, Allan Naim, and our Senior Solutions Architect, Konstantin Ignatyev. Allan kicks-off the presentation by detailing Kubernetes’ genesis and how it improves developer productivity, and enables organizations to put their apps on wheels to facilitate smoother Cloud migrations. Senior solutions architect Konstantin then discusses how Kubernetes addresses common DevOps concerns relating to microservices and SaaS offerings. Using a live application and corresponding code, Konstantin shows that Kubernetes is an excellent option to address challenges – from scalability, portability, to configuration management - while keeping development and debugging simple. •Examine a sample application that uses micro-services architecture. •Learn, point-by-point discussion, how Kubernetes handles typical developer and operations concerns. One of the leading concerns businesses have for adopting a cloud-first mentality centers on security. This presentation will discuss a range of practices, policies and tools designed to decrease your security surface area. We will discuss adding security testing to Continuous Delivery pipelines via tests and build plugins, checklists for building container-based artifacts, VPN & VPC configurations, Multifactor Authentication, IAM & Role appropriations, enforcing encrypted traffic using security groups and automating security patching. Attendees will walk away with a better understanding of where risks exist for projects, a starting checklist on how to start secure projects within AWS and a solid outline on how to incorporate security into your build pipelines. Mike Ensor is a hands-on software architect with 20 years of experience in backend development, e-commerce, Cloud architectures, distributed systems and big data implementations. Throughout his career he has continually pushed the use of test-driven development and emphasized the merits of Agile-based development. Building and maintaining a great piece of software is a multi-year affair that requires a wide variety of approaches. The tools and processes used to launch the project are not the same ones needed to keep it running, nor do they decide when to retire it. Deciding when to make these critical transitions and how to manage them can be challenging. In this seminar Gabe Hicks and Nimret Sandhu will walkthrough the lifecycle of a project from inception to obsolescence, going over the key tools, processes, and decisions that you will face in your own critical applications. In today’s omnichannel commerce environment, meeting the demands of customers can be a challenge. Businesses face the pressure of delivering the seamless interactions that B2C experiences offer. The right B2B e-comm platform can streamline your business processes, and be your key differentiator from the competition. - Gain insight into selecting the right platform for your business. AWS reliability has improved to the point that many customers do not proactively architect for rare AWS outages. But outages do occur. In this meet-up, we'll provide an overview of the AWS Global Infrastructure, and discuss the recent outage in the AWS Sydney region and how some customers avoided any downtime, while others were completely down. - Examples of Dev9 cloud implementations where AWS HA was essential. This episode of Continuous Discussion centers around the AWS re:Invent conference, which we attended earlier this month. Gabe Hicks, Brian Guy and Jeff Ramsdale discuss their highlights and the announcements that they think will be important for AWS in 2017. A modern CMS needs to be a team player in your business strategy. The demands of having a competitive web presence in 2016 mean that the CMS you choose needs to be capable of handling traditional duties – presentation, scaling, archiving, authoring, permissions, for example – in addition to integrating well with other services and current software practices. Operating with a “Legacy CMS” is a guaranteed pathway to pain. In a modern development environment, bulky and hard-to-manage systems will be a neverending source of frustration for your business and your team. On top of that, a CMS without good integration support and proper cloud-ready architecture will hinder your ability to take advantage of recent advances in software delivery. In this presentation, we’ll discuss some of the aspects of a modern CMS that allow it to thrive in today’s software development landscape. We’ll also talk about some of the red flags to look out for when comparing your current CMS to your business’s needs. Gabe Hicks gives a talk on one of Dev9's core Software Development practices, Continuous Delivery. Transitioning off of these hard to maintain systems onto a modern platform can be a daunting task plagued by unforeseen problems, but it doesn’t have to be. In this seminar, Dev9's Gabe Hicks will talk about some of the typical Platform Modernization pitfalls you might encounter and some strategies to avoid them. Our new addition to Dev9's whitepaper series showcases the essential tools that we (and our clients) use to build effective, custom Java software. Dev9's expertise will shed some light on what you need to know to make that transition smooth and accessible. It's easy for all of these factors to result in an explosion of testable combinations. How do you describe these combinations, queue them for execution, and link them to test results in your continuous integration server? How do you design it to be extensible and maintainable? In this presentation, we will discuss our real world techniques for combinatorial testing with Selenium and JUnit, leveraging on-demand resources from Sauce Labs. We will describe successes and challenges encountered along the way. We will discuss concrete problems (and solutions) encountered in Selenium framework design for both a major retailer with multiple simultaneous brand launches, and performance testing involved in the successful launch of a new consumer device used by millions. Dev9 builds custom software solutions based on Continuous Delivery - a set of processes and tools based on a combination of Lean and the heavy use of automation. Dev9 specializes in cloud engineering (AWS), custom development, and off the shelf implementation of content management and e-commerce solutions.